In Mr. Parkinson's room, Colonial Office. Mr. Warner ) ... Foreign Office. Mr. Starling ... Petroleum Department. Mr. Grombie ... India Office The department of the British Government to which the Government of India reported between 1858 and 1947. The successor to the Court of Directors. .
Mr. Blaxter ... colonial Office. 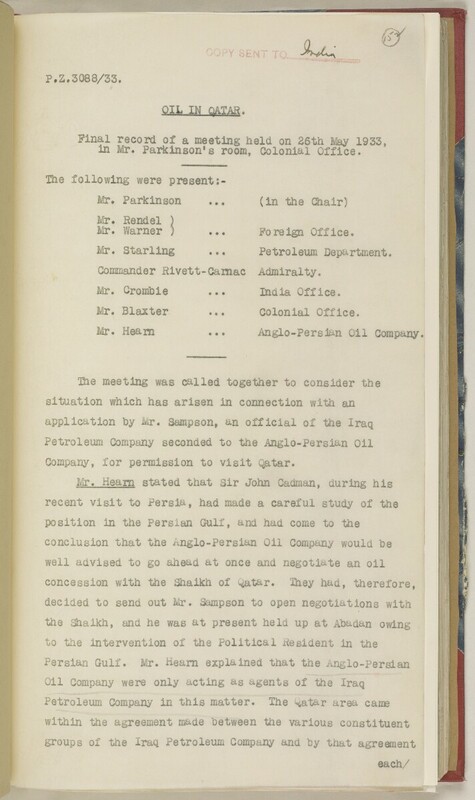 Mr. Heam ... Anglo-Persian Oil Company. Company, for permission to visit Qatar.